This isn’t your ’80s pizza-parlor mushroom and olive pizza–not because that pizza wasn’t righteous, but because I am a creature of habit and make my homemade pizza with a thin crust. And because I buy kalamata olives in bulk instead of canned black olives. And because I usually saute my mushrooms before adding them to pizza. But you could totally serve this pizza with an ice-cold root beer. That would still be rad. Mushroom and Olive Pizza: Preheat oven (and pizza stone, if you have one) to the hottest setting. Stretch out a pizza crust until it’s nice and thin and place on parchment paper. Top with tomato sauce, mozzarella cheese, sauteed mushrooms, and torn kalamata olives. Bake until crust is crisp, about 5 minutes at 550 in my oven. Great post and excellent timing, as I’ll be trying out my new aluminum pizza ‘stone’ for the first time tonight! Completely agree on thin crust and sauteing mushrooms first. Have you ever tried using (uncooked) passata seasoned with some olive oil, salt and sugar instead of using tomato sauce? Helps to keep the crust crunchy but soft. Thanks, would love to hear how it turns out! That looks beautiful! We have a topping combo too in my family. Sausage and mushrooms. Because my brothers refuse to eat anything green and mushrooms are the only “vegetable” that we can all agree on, even though it’s a fungus. In my vegetarian days, it was broccoli, Kalamata olives and fresh garlic. Now it’s pepperoni and jalapeños. I am fond of jalapenos on pizza myself, and I had a pizza with sweet corn this week that was pretty great. I see a spicy summer corn pizza in my near future! I was just about to say that a spicy summer corn pizza sounds like a good idea! I agree with you about a thin crust. I have never thought to to use parchment paper…next time. I’d prefer to make my pizza on cornmeal and slide it onto the stone, which seems less wasteful, but the parchment is more foolproof if I pile the toppings on too thick or stretch the dough too thin! That pizza is totally rad! I love mushroom pizza of any kind. Can’t wait to try this combo. We put olives and mushrooms on our pizza, but have never put them together on the same one. Yum. We prefer thin crust here too. Lately we’ve been skipping the red sauce on our mushroom pizzas and drizzling the ubiquitous truffle oil over the top of the baked pie. 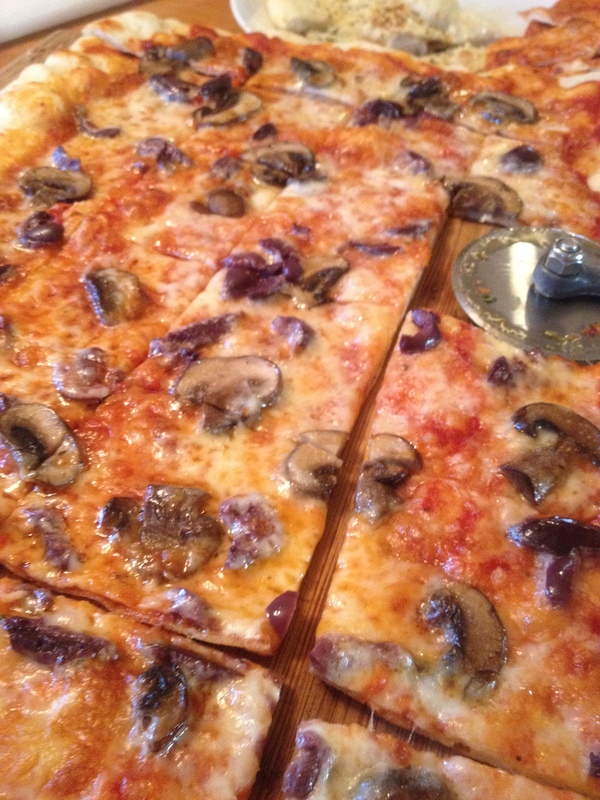 Truffle oil on mushroom pizza, sounds like you’re doing it right! The possibilities are endless. But this one looks really good! I’m scrolling, I’m scrolling, I’m scrolling, bam…. my mouth is watering, it’s watering, it’s watering. Great pic Emmy. For the best grilling of pizzas I’ve found that getting the grill super hot is critical, then get it really clean, then rub the grates with a little olive oil, and then cook one side of the dough just as it is before you add toppings. That gives it at bit more stability. So good! Thanks for the tips–I’ll report on the results! It’s funny, because I don’t drink soda, but the one that occasionally sounds good to me (with pizza, of course!) is root beer. Childhood memories are a strong influence! Mush & olive pizza is my all time favorite, and I have a special place in my heart for 80s pizza parlors! Those brown-clear-textured plastic cups full of iced soda with Rick Springfield on the juke box… awesome to the max! Plus, it’s also in the 60s here in Berkeley, so all in all, I love this post. Thanks! Those are EXACTLY the cups we were drinking root beer from, of course. :) And I had forgotten about the jukebox–I think this was one of those places where you could control it from every booth!